Josh is an associate attorney at Vincent, Romeo & Rodriguez. Prior to joining the firm in 2018, Josh clerked for Judge Roland Belsome on Louisiana's 4th Circuit Court of Appeals, where he drafted appellate opinions in a variety of civil, criminal, and probate related matters. After serving the term of his clerkship, Josh moved to Denver and parlayed his experience with the court into a position with a downtown civil litigation practice where he focused mostly on personal injury and premises liability representation. Now with VRR, Josh is marrying his passion with experience and looks forward to representing clients in probate, will, and trust litigation; as well as advising them in estate planning and administration matters. 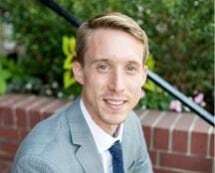 Originally from Virginia Beach, Virginia, Josh earned his undergraduate degree at The University of South Carolina, and after several years exploring the mountains around Jackson, Wyoming, sought and obtained his J.D. at Tulane University Law School in New Orleans. Having lived all over the country, Josh is thrilled to now call Denver home. In his spare time, Josh can be found taking advantage of powder days on the ski hill, sunny skies on Colorado's highest peaks and golf courses, or great tunes at Red Rocks.